A solid week for markets and many stocks are doing very, very well as we run into the holidays as so often happens. There are some hefty gains going on right now and we’re right in the thick of it as usual. We should continue to see strength during the holiday shortened week ahead. It’s a strong time of year generally and this year is no exception. As for the precious metals they are dropping right on schedule out of their very nice bear flags and we should get a low in a matter of days at the latest or risk a much deeper drop that will take months to get over. 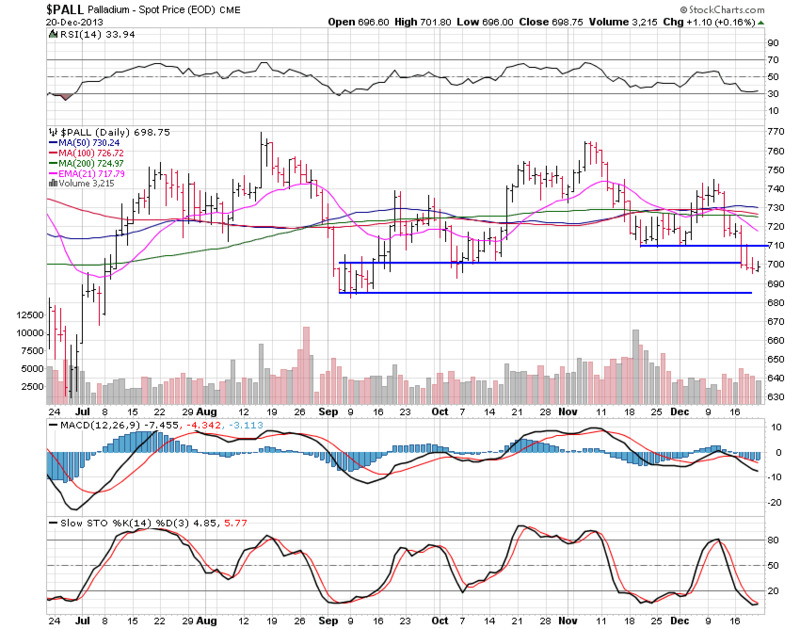 I’m wishing for a quick low here but it’s never up to me, I just read the charts and tell it like I see it. Let’s see what I’m seeing in the charts this weekend. 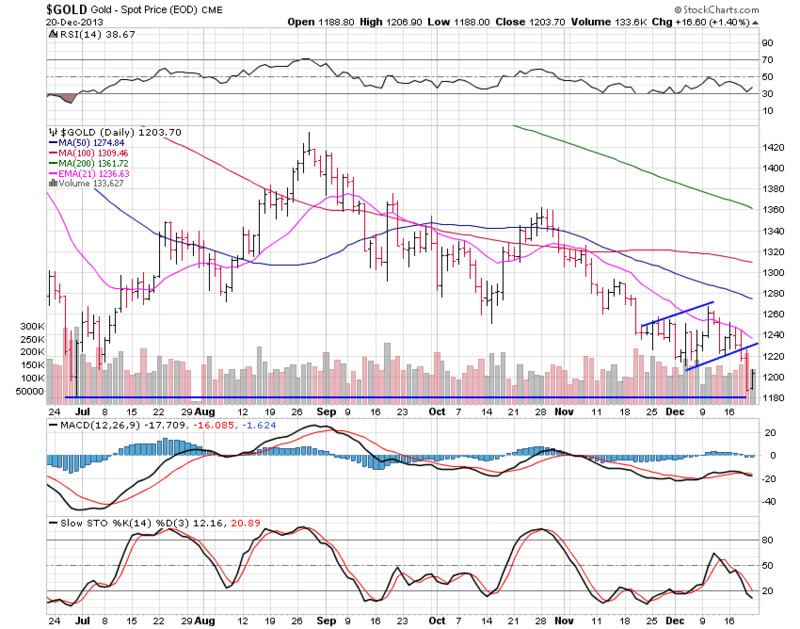 Gold slid 2.77% below it’s bear flag this past week and did so right on schedule. It’s ugly action unless you are shorting gold but it was easily seen and I’ve talked about these coming drops here repeatedly before they occurred this year. We need a quick drop under $1,189.40 and then a sharp move back above that level to close the day out in order to put in a proper double bottom. That said, charts are not always perfect or display textbook action so we could have a not so perfect double bottom in here now but I will need to see a move at least above $1,240 before I would consider that as true. Only time will tell what happens from here but I think, and really would like to see, a proper double bottom put in here just in time for Christmas. This would spark a nice move in 2014. Silver fell 1.05% for the week and broke it’s bear flag perfectly as well. I am more focused on gold now to tell me where silver will go. If silver were trading alone I would say it has a good ways lower to go, at least to $18 but gold could override this. The perma-bears are not having a great year and must really be hurting this holiday season. I really can’t understand why someone has to have such conviction in losing money but it happens. I’ve not seen a lot of capitulation yet by those strong holders so perhaps we’ve got more to go on the downside. 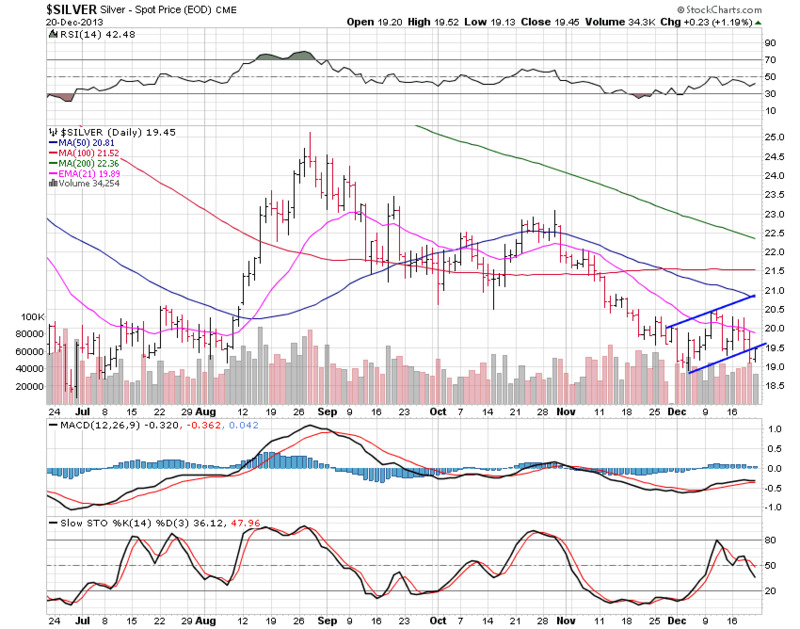 Platinum slid right out of it’s bear flag and ended up 2.20% lower in the end for the week. If $1,300 can’t hold then $1,260 is the next support level. Great action if you are on the short side for sure. These bear flags are some of the most reliable patterns and I’m always looking for them, but on the flip-side, bull flags are also great as we’ve seen in many stocks this year who’ve made this a spectacular year for us. As with silver, if gold puts a perfect low in soon, platinum will also follow it higher. Palladium ended the week lower by 2.48%. Palladium sliced right through $710 support and is now holding at the $700 support area. 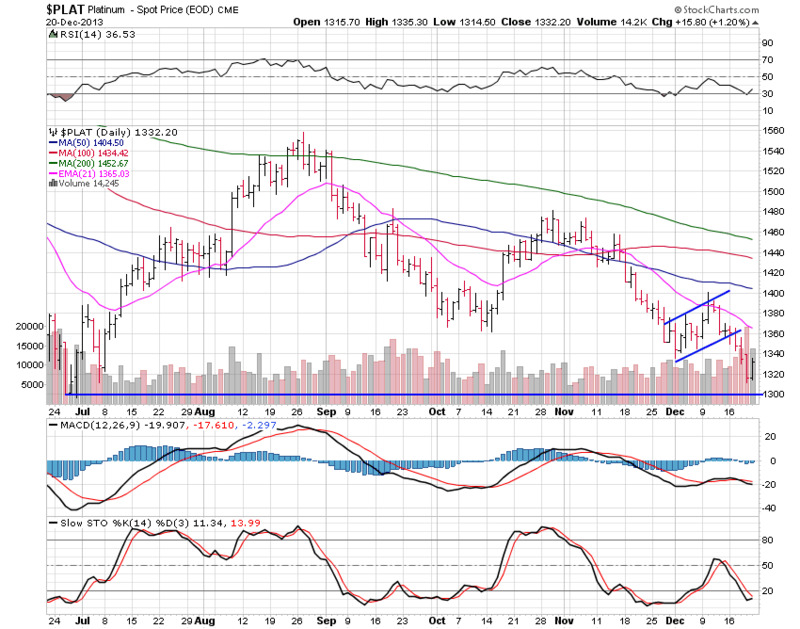 Next support is $685 or so and this metal will also quickly reverse higher if gold puts in a confirmed bottom. Charts build patterns that are quite reliable most times as we’ve seen in the metals the past several months but regardless of what silver, platinum and palladium charts are saying, if gold bottoms, they will also. I echo my recent thoughts that if you’ve held this long then don’t be a seller here since we could be very near a low and we should know this to be true or not by year’s end or sooner. I wish you a wonderful holiday season and hope you’ve done well this year. Even if you haven’t done so well, don’t worry. You can always come back from losses or failures as long as you learn from your mistakes. The best is still ahead.